Air-Ease Draining Pan Useless "Solution"
The County occupancy inspector needs an explanation and drawings how the condensation is handled on the air blower unit upstairs. Because there's no floor pan they will not pass that unit unless they get this information. Did the inspector receive the information that was sent to the Builder several weeks ago regarding this unit? We had a meeting with the inspector, architect, and builder on May 23rd. They were asking about the information on the air blower, so apparently they did not receive what they were looking for before that date. They want detailed information, preferably from the manufacturer, how the unit handles condensation water since it does not have a floor pan. It would be great if you can resend/refax it to us. The information sent to the Builder was from the manufacturer. OK, I will resend this to you today. I have been asked by my customer to provide information to you regarding the drain pan on a geothermal unit at his new home. The unit in question is a counterflow or downflow or bottomflow application where a secondary drain pan is not possible. There has been a conversion kit installed on this unit per the manufacturers recommendation – copy is attached for your review. 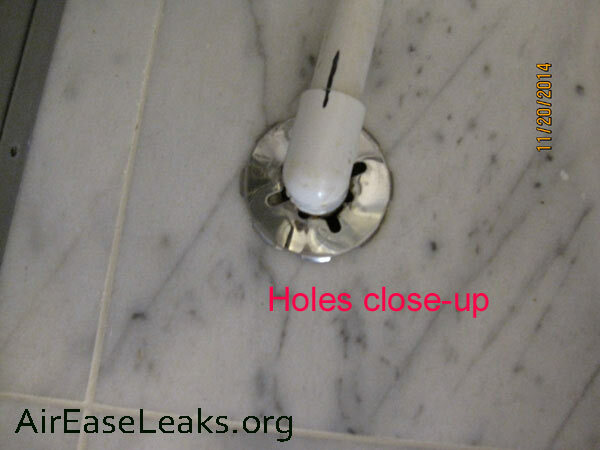 The drain pain included is corrosion proof stainless steel. There is no mechanical need for a secondary drain pan. Please contact me if this does not meet your approval. County wants a sensor installed in the drain pan. Please let me know when we can install this. When can Bob come then? We'll be at the house BOTH on Monday AND on Tuesday from 8:30AM to 2-3PM so Bob could come then. Also, there's still a small leak from one of the pipes that Bob previously fixed so he could fix it, hopefully for good. You are scheduled for Tuesday. By design, P-traps on any draining pipes are meant to hold inside standing water to prevent sewer vapors from entering the room. However, our 2-nd floor AC blower unit draining pipes run into floor outlet that has holes all around it, so all the vapors can enter the room from the floor level. 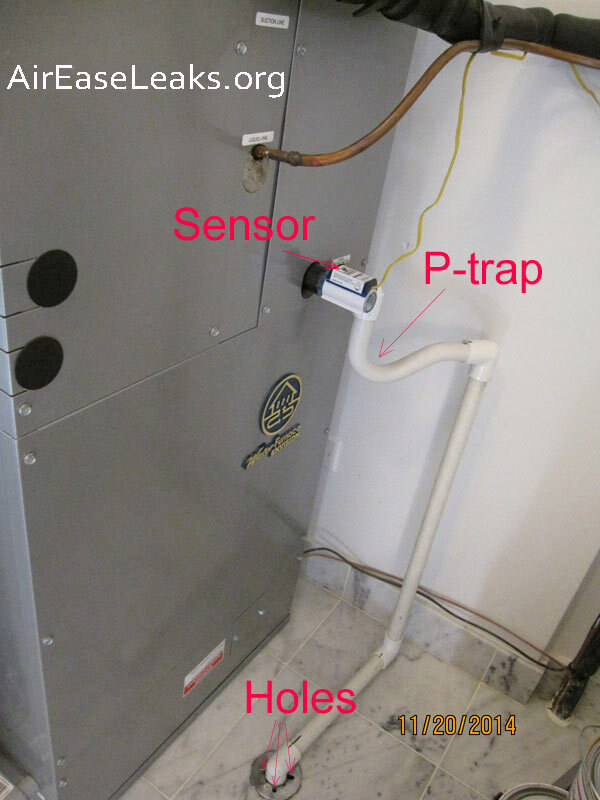 The installed P-trap therefore does not server its intended function. However, it does create a “plug” made of slushy jelly-like substance which the standing water turns into in the collecting pan and the P-trap portion of the draining pipes. The jelly-like substance is produced by natural process of mold and other organism developing in the standing water. It effectively stops water from draining, and the pan overflows and floods the unit inside and the floor outside. The little sensor device, we were advised, was supposed to sense standing water when its levels were too high in the draining pan. 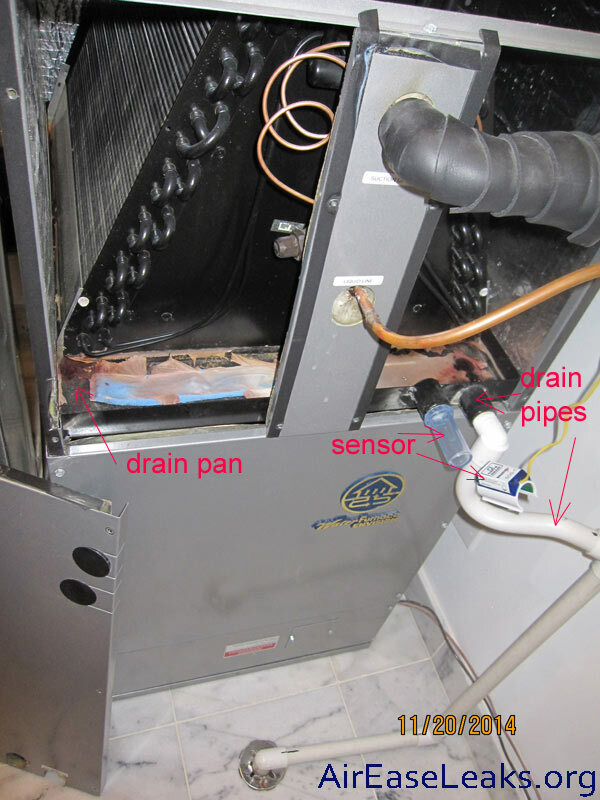 When the sensor light turned on, it was supposed to turn the blower unit off to prevent overflowing draining pan. This is the theory. In practice, the sensor light is on basically all the time when the unit is working as AC blower, and it does not turn the unit off. The floor flooded twice in the first year we used the system. In practice, the sensor device is completely useless. To address this 2-nd floor flooding issue, we had do our own research and finally found someone knowledgeable enough to advise us to purchase drain pan treatment sponges. The blue sponge bar releases chemical compound of some sort to stop water from turning into jelly, and keeps the drain actually draining. They are fairly expensive for what they are, but luckily one set during cooling season is enough. 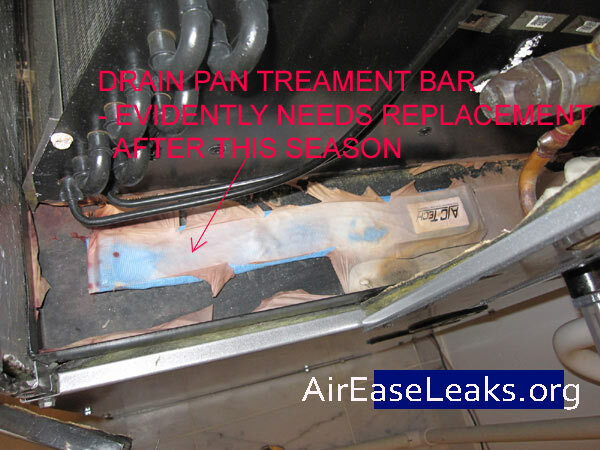 By the way, the system maintenance was performed by Air-ease end of this September. Evidently, this blower unit, which serves as a back up air-forced 2-nd floor heat during winter time did not need any cleaning or care.